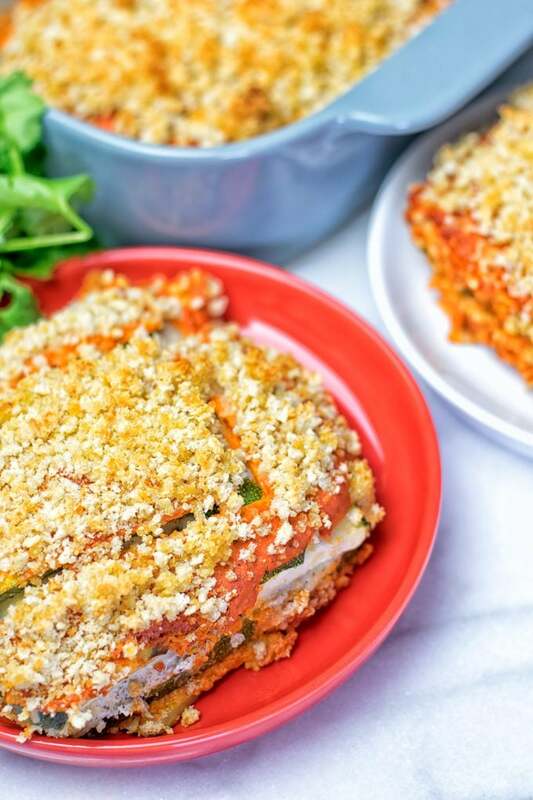 When you make this Vegan Ricotta Zucchini Casserole, you only need 6 ingredients to treat yourself to a quick lunch or dinner. This time saving plant based recipe is gluten free and soy free, satisfying and totally delicious. I guess you all realized that I like to comment on my wish for warmer weather here. Guess what? Somebody must have flipped a switch. From one day to the next we started having beautiful sunny summer weather. So enjoyable! And do you know what happens when the warmer days arrive? I’m craving more zucchini? Yes, somehow it’s the ultimate summer vegetable for me, even though it is available the whole year. Of course my zucchini cravings aren’t completely new here. 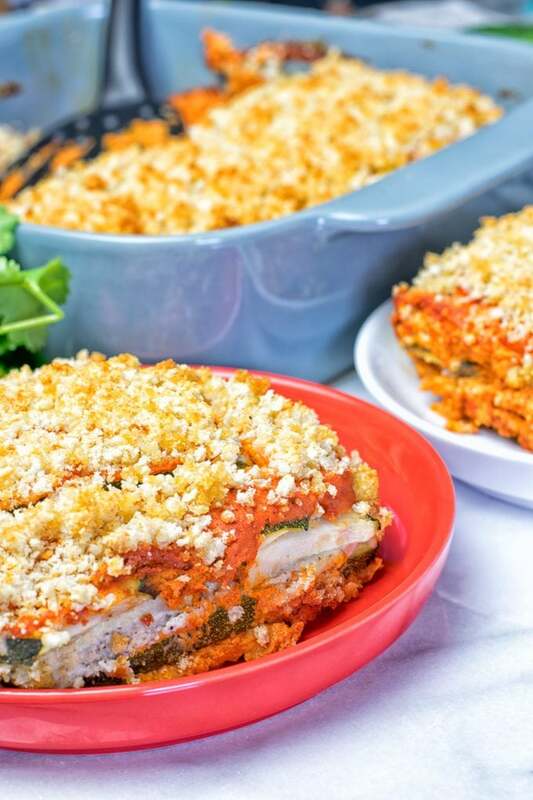 I recommend taking a look at my Tempeh Bacon Zucchini Casserole, the Vegetable Lasagna, or maybe Chocolate Chip Zucchini Bread, if you’re more into a nice vegan dessert. 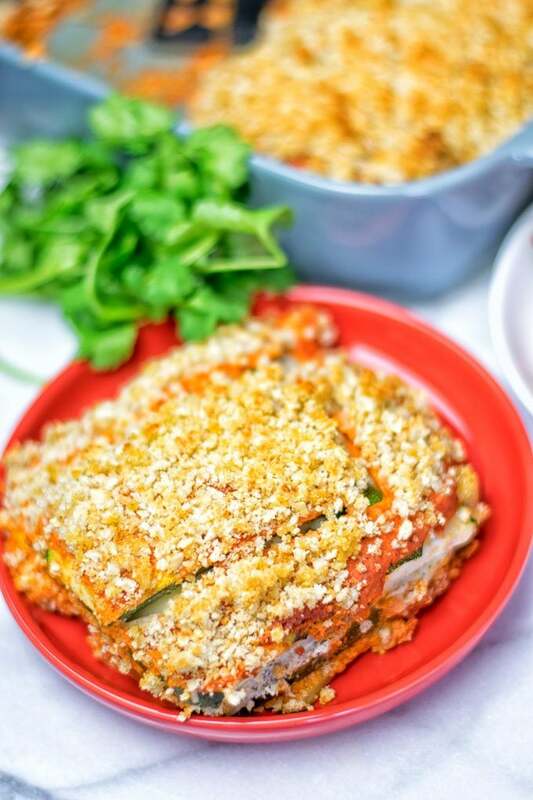 I hope you guys are already in the green and fresh zucchini mood and come on board to discover this Vegan Ricotta Zucchini Casserole. It’s super creamy, satisfying, easy, full of amazing flavors, impressive, comforting, drool-worthy, mouthwatering, exciting, eye catching and the best for your summer vibes. Of course, it is also soy free, allergy-friendly, and dairy free. Shall we start doing this together? First prepare the vegan ricotta. Simply add all the ingredients (brazil nuts, lemon juice, nutritional yeast, water, and salt, pepper) in a blender and process until smooth and creamy. Set aside. With the vegan ricotta and prepared Muhammara, slice the zucchini in long, thin slices. Now we assemble: start with spooning Muhammara on the bottom, cover some zucchini slices, and season with salt and pepper. 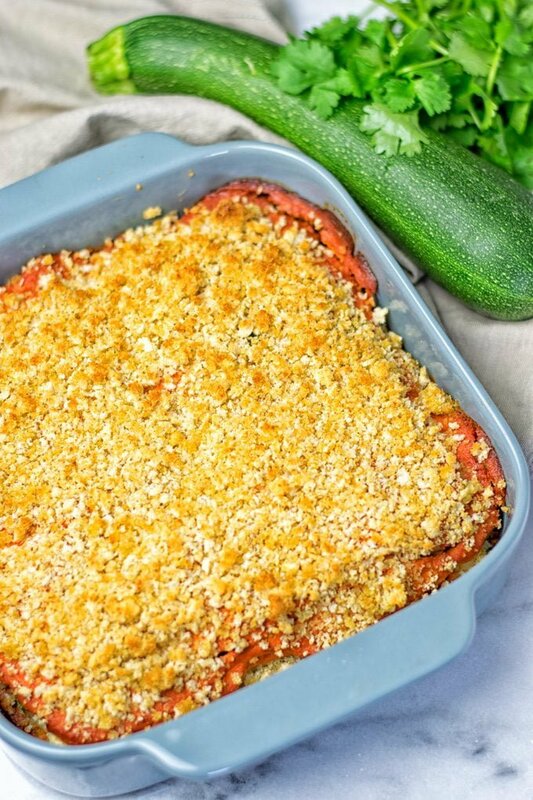 This is really important for the flavor, otherwise the Vegan Ricotta Zucchini Casserole might taste bland. Sprinkle a bit of the breadcrumb topping over it, then about half of the ricotta. Repeat until you’ve finished. The last layer should be muhammara and breadcrumb topping. Now we are almost there, friends. The last thing we need to do is bake the casserole for 35 minutes at 410°F. I recommend to cover the top with aluminum foil. This is important because otherwise the breadcrumb based topping will likely burn. After the 35 minutes, take the aluminium foil off and bake for another 10 minutes. You don’t need to precook the zucchinis, they will cooked in the casserole. 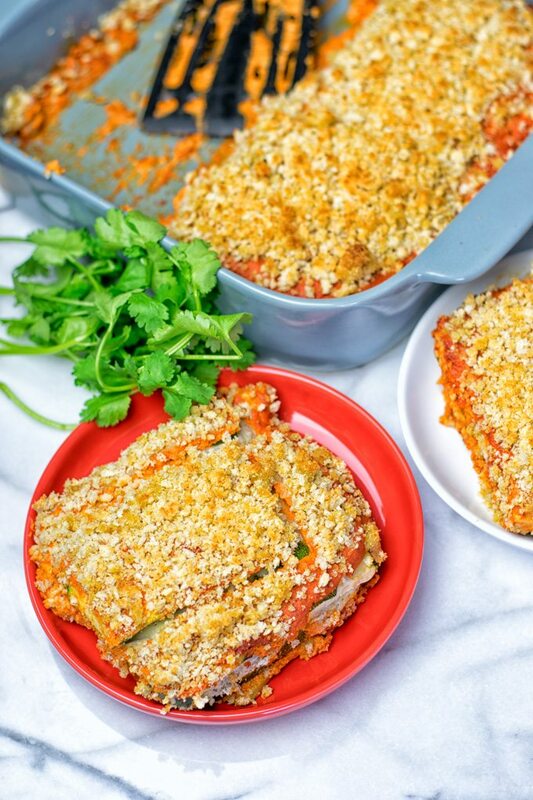 This casserole is definitely inspired by my love for cheese before vegan days. Ricotta was something that I had a really soft spot for, so it’s not a big surprise that I came up with a veganized version. I actually did a lot of testing before with the ricotta recipe. I tried it with cashews or almonds. While it was delicious, I find that only Brazil nuts gave the real ricotta flavor. With almonds and cashews I got a fantastic flavor, but I could still taste the cashews and almonds. So I find Brazil nuts are being almost neutral. There isn’t its typical nut taste. Just this Vegan Ricotta Cheese recipe is delicious on it’s own. Eat with bread or top your salads and soups with that. Possibilities are not limited, so dream big. 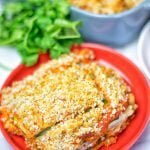 Did I tell you that you only need 6 ingredients and 3 easy steps here to make my Vegan Ricotta Zucchini Casserole? With such simple ingredients that I bet most of you already have in your cupboard. If not, you can get all of them easily in every supermarket. Right, you don’t need any fancy equipment or complicated ingredients here. I find delicious and good food does not need that. It only needs the best flavors and this will definitely do the trick. Zucchini is a powerhouse. It’s low in calories but high in vitamins C and A. It’s super versatile to enjoy it as as low-carb pasta alternative. Brazil nuts get into the game too. They are high in selenium, which is a immune boaster, and are also an amazing source of magnesium, manganese, iron and zinc. But we’re not done here friends. Nutritional yeast: high in protein, amazing source non animal source of vitamin B12, also high in fiber, and gluten free. If you want to learn more, check this out “Here’s Why Nutritional Yeast Is The Magical Ingredient You Didn’t Know You Needed“. If you give this a try, show me your excitement on Instagram or Facebook. First prepare the vegan ricotta. Simply add all the ingredients (brazil nuts, lemon juice, nutritional yeast, water, and salt, pepper) in a blender and process until smooth and creamy. Set aside. 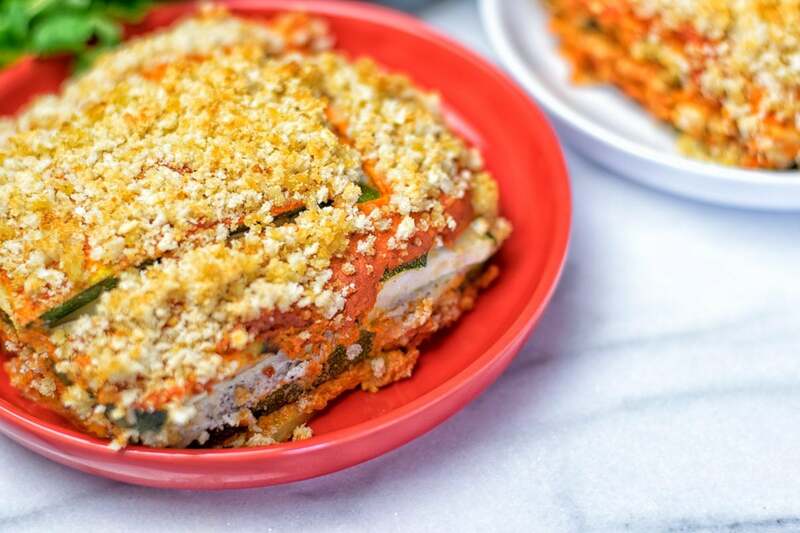 With the vegan ricotta and prepared Muhammara, slice the zucchini in long, thin slices. Now we assemble: start with spooning Muhammara on the bottom, cover some zucchini slices, and season with salt and pepper. This is really important for the flavor, otherwise the Vegan Ricotta Zucchini Casserole might taste bland. Sprinkle a bit of the breadcrumb topping over it, then about half of the ricotta. Repeat until you’ve finished. The last layer should be Muhammara and breadcrumb topping. The last thing we need to do is bake the casserole for 35 minutes at 410°F. I recommend to cover the top with aluminum foil. This is important because otherwise the breadcrumb based topping will likely burn. After the 35 minutes, take the aluminium foil off and bake for another 10 minutes.